Client opens a connection and requests data from the server. The server calculates the response. The server sends the response back to the client on the opened request. Polling is a standard technique used by the vast majority of AJAX applications. The basic idea is that the client repeatedly polls (or requests) a server for data. The client makes a request and waits for the server to respond with data. If no data is available, an empty response is returned. Client opens a connection and requests data from the server using regular HTTP. The requested webpage sends requests to the server at regular intervals (e.g., 0.5 seconds). The server calculates the response and sends it back, just like regular HTTP traffic. Client repeats the above three steps periodically to get updates from the server. Problem with Polling is that the client has to keep asking the server for any new data. As a result, a lot of responses are empty creating HTTP overhead. A variation of the traditional polling technique that allows the server to push information to a client, whenever the data is available. With Long-Polling, the client requests information from the server exactly as in normal polling, but with the expectation that the server may not respond immediately. That’s why this technique is sometimes referred to as a “Hanging GET”. If the server does not have any data available for the client, instead of sending an empty response, the server holds the request and waits until some data becomes available. Once the data becomes available, a full response is sent to the client. The client then immediately re-request information from the server so that the server will almost always have an available waiting request that it can use to deliver data in response to an event. The client makes an initial request using regular HTTP and then waits for a response. The server delays its response until an update is available, or until a timeout has occurred. When an update is available, the server sends a full response to the client. The client typically sends a new long-poll request, either immediately upon receiving a response or after a pause to allow an acceptable latency period. Each Long-Poll request has a timeout. The client has to reconnect periodically after the connection is closed, due to timeouts. WebSocket provides Full duplex communication channels over a single TCP connection. It provides a persistent connection between a client and a server that both parties can use to start sending data at any time. The client establishes a WebSocket connection through a process known as the WebSocket handshake. If the process succeeds, then the server and client can exchange data in both directions at any time. The WebSocket protocol enables communication between a client and a server with lower overheads, facilitating real-time data transfer from and to the server. This is made possible by providing a standardized way for the server to send content to the browser without being asked by the client, and allowing for messages to be passed back and forth while keeping the connection open. In this way, a two-way (bi-directional) ongoing conversation can take place between a client and a server. Under SSEs the client establishes a persistent and long-term connection with the server. The server uses this connection to send data to a client. If the client wants to send data to the server, it would require the use of another technology/protocol to do so. Client requests data from a server using regular HTTP. The requested webpage opens a connection to the server. The server sends the data to the client whenever there’s new information available. SSEs are best when we need real-time traffic from the server to the client or if the server is generating data in a loop and will be sending multiple events to the client. 1.) Install docker setup on your machine . Follow this link : https://docs.docker.com/engine/installation/#time-based-release-schedule. 2.) I have build caffe ubuntu image and push to docker hub . You can pull it in to your local. // it will download the image if its not downloaded before. If you install any necessary packages inside that image then you need to commit it to make changes persist . 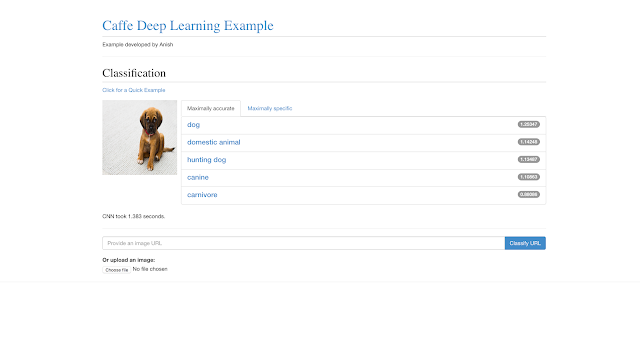 Problem of creating knowledge graph from unstructured data is a well known machine learning problem. Not even a single org has achieved 100% accuracy for completely enriched knowledge graph . I have few findings that will help to kick-start for a person who is new in to this . "Apple was founded by Steve jobs and current CEO is Tim Cook. Apple launched several products like Ipad, iphone , MAC etc. " Corpus may be very complex sentences also . Problem is how can we build a knowledge graph out of this unstructured corpses . 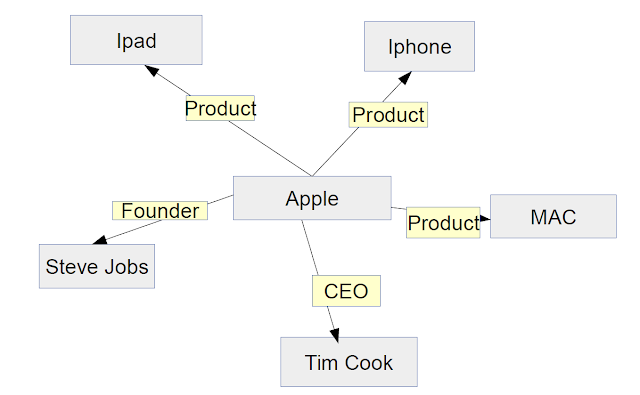 If we create generic knowledge graph , then our system should be able to provide answers like "who founded Apple ?" , " What are products launched by Apple ?" etc . Here is a algorithm which uses dancing link to solve algorithm X(exact cover) that solves upto 100*100 sudoku. 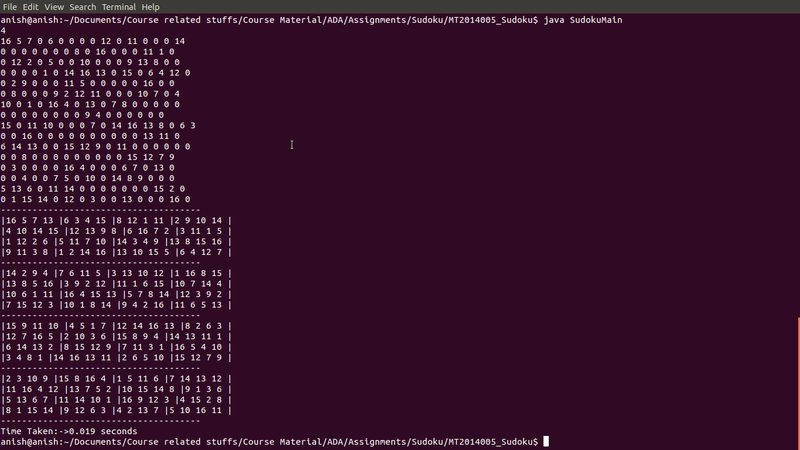 Algorithm has been implemented using JAVA and can be able to solve Sudoku of any difficulty level(easy,hard,very hard). 1.) Algorithm first find out the number of possible elements in each cell , algorithm for this can be seen in the code. 2.) After this apply rule1 which says finds that cell which has a single possible element , this works recursively until we find single possible element. 3.) After this apply rule2 which says if there is a number which can go into only one cell, then assign that number to that cell. 4.) Rule2 and rule1 run recursively. opencv java configuration with eclipse.